The reviews keep comin in! I’m delighted to report another review of The Other School Reformers. This one is by Princeton’s Kevin Kruse, in the pages of the Journal of American History (sorry, subscription required). Non-academic readers might not know Professor Kruse, but every nerd knows that he has done as much as anyone to help us understand what it has meant to be “conservative” in American history. Naturally, I was anxious to see what this uber-expert would think about my book. Did he think my argument about the development of “educational conservatism” was worthwhile? Kruse’s first book, White Flight, examined racial politics and their implications in Atlanta. His more recent book, One Nation Under God, has stormed the best-seller lists. So when it comes to expert opinion about the history of American conservatism, it would be hard to find a more qualified reviewer than Professor Kruse. It was with some trepidation that I first opened his review of The Other School Reformers. Each of these case studies is carefully drawn, built upon a deep foundation of original research and a strong engagement with the secondary literature. Together they demonstrate quite ably that “educational conservatism”—and, indeed, conservatism writ large—was constantly evolving, site to site, moment to moment, across the twentieth century. Taking aim at the historian George Nash’s 1976 claim in The Conservative Intellectual Movement in America since 1945 that modern conservatism resulted from a deliberate campaign to bring together Burkean traditionalism, libertarianism, and Cold War anticommunism, Laats argues convincingly that “conservatism, for most educational activists, was not a deliberate fusion of disparate strands of ideology but rather variegated fruit from the same tangled vine” (p. 12). Over the years, conservative thinking on the key issues of race, religion, and science changed dramatically, as did conservatives’ belief in the proper role of educational experts and the federal government. 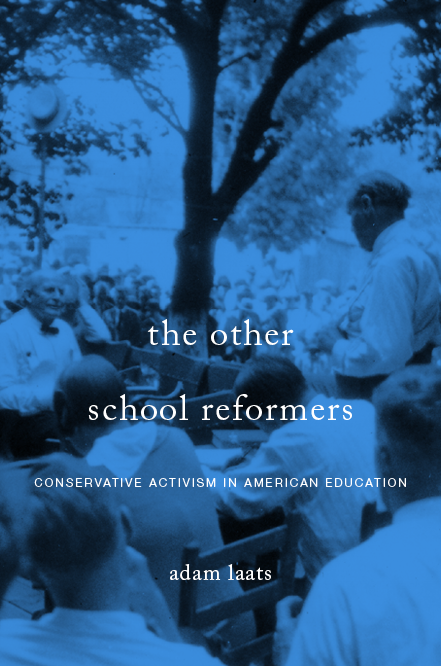 Well researched, well written, and well argued, The Other School Reformers offers a clear, evenhanded account of conservative activism in public education. It also makes a persuasive case for studying the lessons of their struggle seriously, as insight into the larger workings of modern conservatism and the traditions it sought to define and defend beyond the classroom.